Yesterday I mentioned going to Google for directions for making an eye splice. Well, I decided that just wasn't right. Here I am living on an island with a long seafaring tradition. I needed to be reminded first hand how to splice. It didn't take me long. I mentioned my quest to that old salt William Nathan (actually, he's a few years younger than me), and he told me to bring the rope by and he'd help me out. Our latest Ocracoke Newsletter celebrates colorful islander Don Wood (1936-1998). You can read it here: http://www.villagecraftsmen.com/news042610.htm. 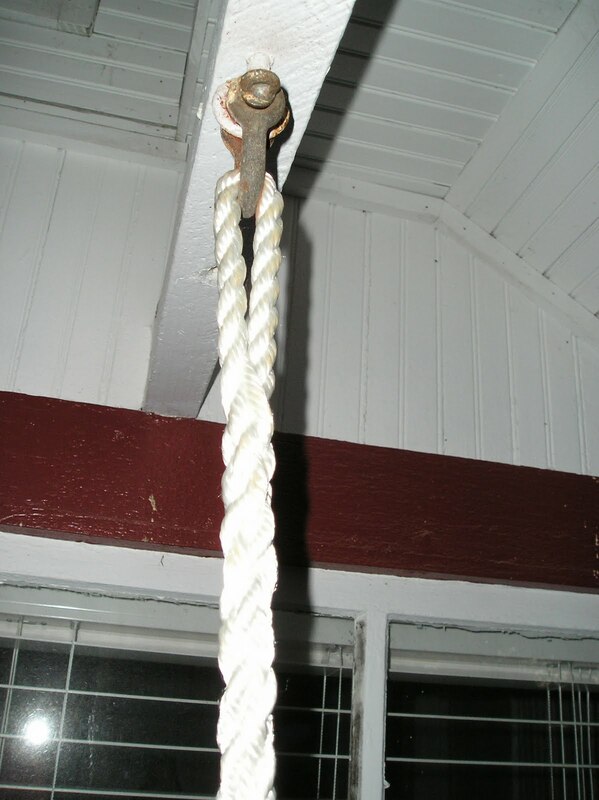 It's always a good idea to know a few simple knots -- overhand, square, bowline, sheet bend. And it's not a bad idea to be able to splice. Yesterday I decided to replace the chains on my porch swing with rope and I needed to make a simple eye splice. 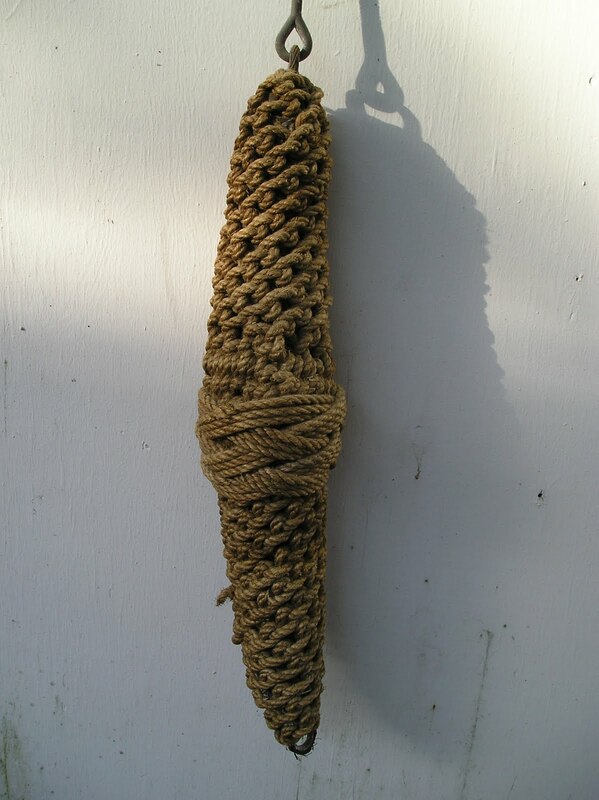 It's been years since I've spliced rope, and my immediate thought was to just ask my dad. Of course, my dad's been dead seven years...and Fowler's no longer with us either. But it only took a quick Google search to find clear directions. Lachlan's too young to teach many knots to. He can't even tie his shoes yet! But I guess it's not too early to at least show him a few different knots. Maybe by the time he's a teenager he won't need the Internet to be able to tie a square knot. Walking along the beach...sitting on the Community Store porch...tending to a garden...raking for clams in the sound...reading a good book......Oftentimes it's these kinds of activities that provide the most pleasure in life. Yesterday evening I walked across the lane to visit Blanche. Frankie was there. We chatted for over an hour. We didn't solve any world problems...didn't even try. But we told stories (including Frankie's first encounter with my Uncle Homer -- how he lay down inside the chicken yard and played with the biddies), laughed (in my mind I can still hear Blanche Styron commenting in her inimitable way, "There's something funny going on there, young-uns"), remembered stories of hurricanes (the 1899 storm that washed numerous schooners ashore, the 1944 storm that tore down docks and ran a trawler into Mr. Walter's upstairs window, and Isabel that brought about six inches of tide into Blanche's house), and recalled trips to Portsmouth (especially Blanche's 1943 trip when about 60 Ocracokers went across the inlet with Mr. Tilley the preacher to hold services and visit with the half dozen families who still lived there). The visit was too soon over, but it was almost 10 o'clock and I still hadn't had my supper. So I bade them goodnight and walked back to my little cottage. So often it's the simple things that give the most pleasure. 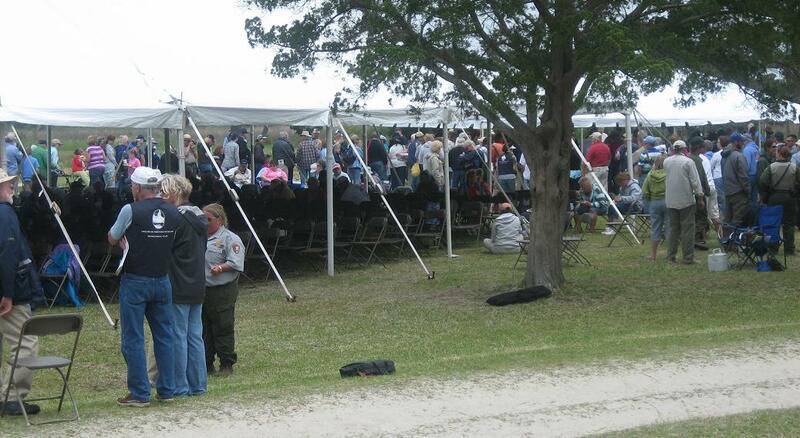 Many thanks to Jim Fineman for sending me the following photos of the 2010 Portsmouth Island Homecoming. Established in 1753, Portsmouth was a prominent seaport on the Carolina coast, but steadily declined after the Civil War. The last residents, Marian Babb & Elma Dixon, left the island in 1971 shortly after Henry Pigott died. 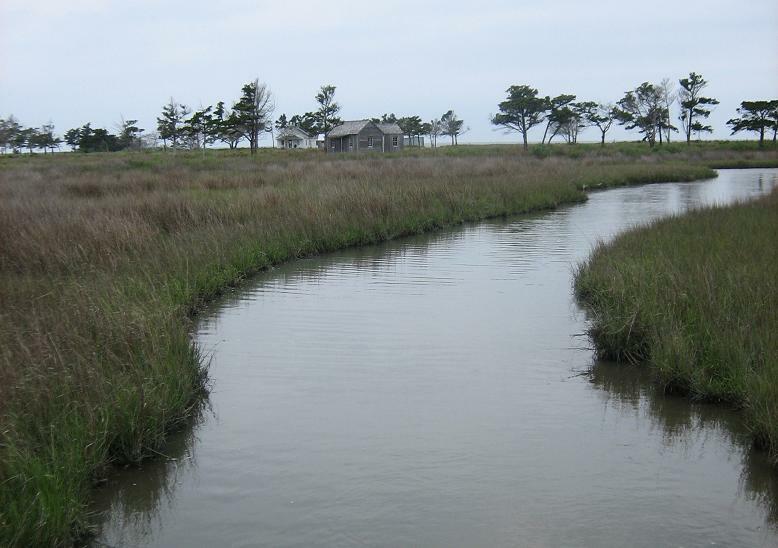 Today the island and the village are part of the Cape Lookout National Seashore. Walking the sandy lanes, exploring the village, and visiting the abandoned buildings is a magical experience...whether you are one of only a handful of people on the island, or one of hundreds who return every two years for the Homecoming. We've done it again. We've published our latest Ocracoke Newsletter. This month's article focuses on islander Don Wood (1936-1998), an island character who contributed so much local color to our unique community. I published one Don Wood Thanksgiving story on this journal some months ago. This current article expands on that story, includes another Turkey Day story (Don in Brigitta's hot tub! ), as well as a couple of photographs. Enjoy the stories...and I hope they inspire creativity and an independent spirit. 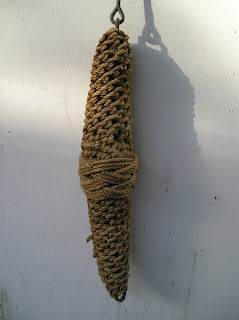 You can read this month's newsletter here: http://www.villagecraftsmen.com/news042610.htm. Art Linkletter's House Party was a TV program that aired from 1945 to 1967. One feature of the show was a segment called "Kids Say the Darndest Things." I was reminded of the show yesterday evening. 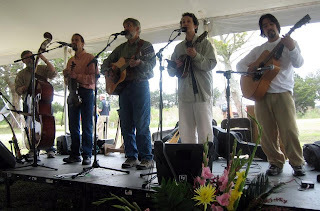 I had accompanied our Molasses Creek band to Portsmouth where they performed for the Homecoming. 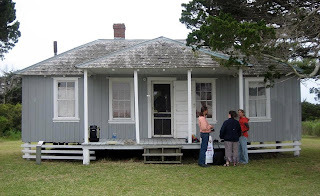 When we returned to Ocracoke we decided to gather at my house for dinner and an evening of socializing. Outside, my five year old grandson, Lachlan, plucked a yellow flower from the edge of the yard, and handed it to me as a gift. "Lachlan," I said, "take it inside and put it in a glass of water to keep it fresh." Lachlan just looked at me...and said "It's YOUR flower." And then he walked away. 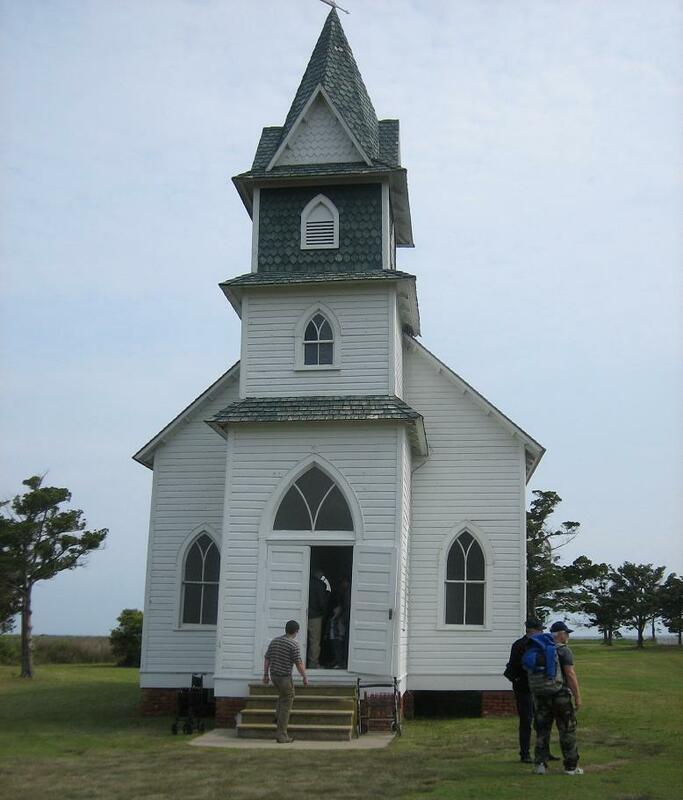 This month's Ocracoke Newsletter is about "Ocracats" and was written by Pat Garber. You can read it here: http://www.villagecraftsmen.com/news031710.htm. I'm off to the docks early this morning...to help Molasses Creek band load their instruments on the boat for Portsmouth. It takes about 15 - 20 minutes to cross the inlet. Then we'll have to carry the equipment into the village. Unfortunately there's a 20% chance of rain and thunderstorms today. But we're hoping for the best anyway. Look for a report on the Homecoming celebration in a few days. That's the title of a new photographic exhibit at the Ocracoke Preservation Society Museum that celebrates Portsmouth Island and the village there. The photos were taken by Carteret County native, Frances Eubanks, and will be on display for the entire 2010 season. Tonight, from 5:30 to 7:30 OPS will host a reception that is open to the public. Aaron Caswell and Lou Castro will provide music. Be sure to stop by the museum this evening if you are on the island. Visitors sometimes ask, "What do you do on this island?" Well, there's usually plenty to keep us busy...if we want to be busy. And it's nearly always fun and entertaining. 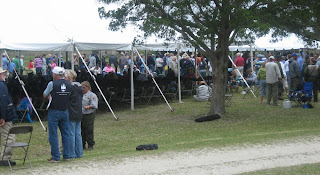 This Saturday, in addition to the Portsmouth Island Homecoming (see Tuesday's post), our new radio station, WOVV, will be holding its annual BBQ & Concert from 4:00-10:00 at the Ocracoke Community Center. The concert will feature the Aaron Caswell Band, Rob King, Free Poor, Craig Ramey, & April Trueblood. Tamales will be served, and there will be a silent action. Also on Saturday, from 11 a.m. to 1 p.m. the Ocracoke Child Care will sponsor their annual Hoop-A-Thon fundraiser in the Ocracoke Gym. Teams include OcraTots (ages 6 weeks - 2 years), Hoopsters (ages 2-3), and Stars of the OCSea (ages 3 and up). Hot Dogs, Mexican food, and baked goods will be available from 11 -1 (or until sold out). There will also be a massage raffle. All money raised goes towards improving child care. That's the best way I can describe it -- an ordeal. A month ago I wrote that Lou Ann had ruptured a disc in Beijing. She had spent just over a week in the hospital in China. Finally we secured a first class, non-stop flight back to the states. I met her at the airport and spent the next two weeks caring for her (she couldn't walk, and was in excruciating pain) and carrying her to doctors and hospitals for consultations, x-rays, MRIs, and epidurals. About two weeks ago she had surgery (many thanks to her doctors, nurses, and other practitioners of modern medicine! ), and is now pain free. She still has weakness and numbness in her left leg and foot, but she is recovering nicely. I am back home (arrived on the island Sunday night), and Lou Ann is planning to be back on Ocracoke before the OcraFolk Festival in early June. I am still catching up (mowing grass, cleaning debris from the demolition, paying bills, writing emails and letters, buying groceries, etc.). I plan to be on the beach this afternoon. Wave if you pass by. Every two years the "Friends of Portsmouth Island" sponsors a homecoming across the inlet. This year the event takes place this coming Saturday, April 24. 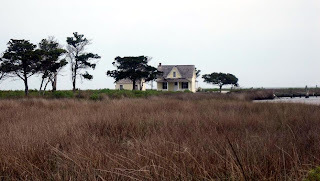 Portsmouth Island lies just south of Ocracoke and has been abandoned for about 35 years. The National Park Service now manages the entire island, including the village. There will be "open houses" at the post office (where you can get a one-day-only Portsmouth stamp cancellation), Methodist church, schoolhouse, US Life Saving Station, and selected homes. 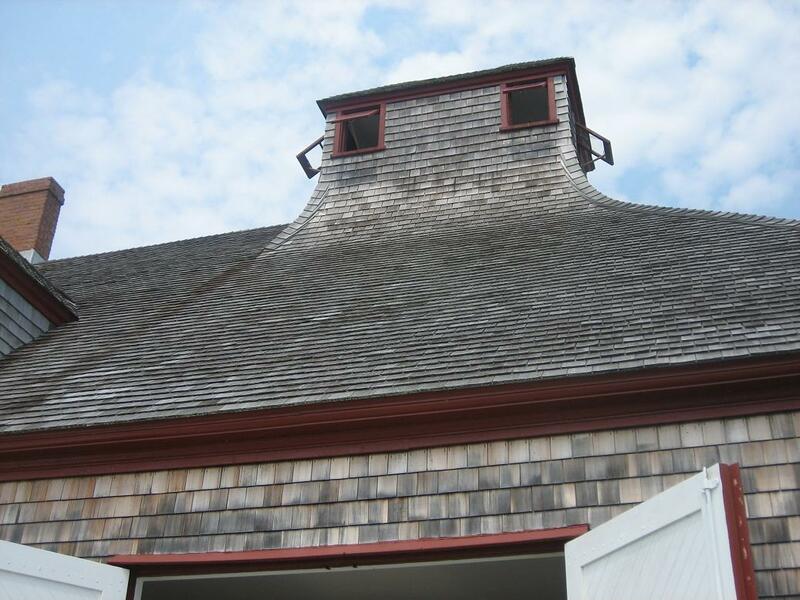 Volunteers will also offer porch talks & demonstrations (quilting, boat building, net mending, and decoy carving), and new exhibits at the Visitors Center will be officially opened. This year's theme is "Celebrating the Life of Portsmouth Village." 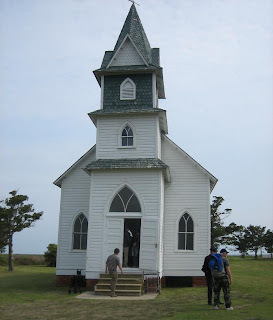 Two hymn sings are scheduled at the church, as well as a potluck dinner on the grounds. This is a wonderful event that highlights one of the most unique villages on the Outer Banks. If you are on Ocracoke this coming Saturday, make arrangements to join the festivities across the inlet. You'll be glad you did! Back in November I published a short story about Don Wood (1936-1998) and his Thanksgiving dinners. Don was a colorful island character and much loved by native O-cockers, newcomers, and those island visitors who learned to know him. On that particular blog I had a comment by Michael (I confess, I don't know who this Michael is, but he seems to know the island well) who wanted to know if I was familiar with the story of Don in Brigitta's hot tub. Finally, just a couple of days ago, I had an opportunity to ask Don's daughter about the hot tub incident. She was delighted to share the story...and to chat about her father's life on Ocracoke. She even sent me a great photo of Don with some island friends. I'll be publishing our next Ocracoke Newsletter before the month is out, and it will be the expanded stories of Don, his Thanksgiving dinners, and the hot tub. 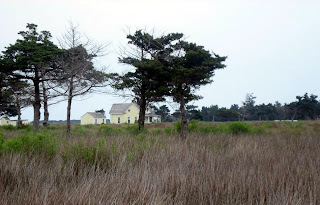 So...Michael (whoever you are), and the rest of our readers who enjoy reading about the eccentric lives of Ocracoke islanders, please keep reading the blog daily. I'll publish the link to the Don Wood stories as soon as I publish it. "4. How do I apply for a priority pass? This is only available at the Hatteras-Ocracoke route. Since ferry boat is the only way to access Ocracoke Island, businesses, services and individuals who travel back and forth more than twice a week, each week can apply for a priority pass. Passes are issued on an as-need basis at the beginning of each year. Call the Hatteras operations office at (252) 986-2353 or Ocracoke operations at (252) 928-1665 for further information." There is actually more than one type of priority pass -- one is for residents, and the other (described in the above paragraph) is for "businesses, services and individuals who travel back and forth more than twice a week, each week." I searched the DOT web site and could not find any official information about resident priority passes. I suppose that is because all residents know about them. I'll explain them, along with a bit of other information, below. The commuter pass, which is for the toll ferries (Cedar Island & Swan Quarter) is entirely different. There is no priority loading on these vessels. However, anyone can purchase a commuter pass which allows frequent travelers to ride the ferries at a reduced rate. Resident priority passes are only for the Hatteras Inlet ferries, and are available only to permanent, full time residents of Ocracoke Island. If I remember the details correctly, in order to obtain a pass you must present a NC driver's license with an Ocracoke address, as well as other proof of island residency (e.g. a utility bill). At the time when new passes are issued, the requirements are posted on the bulletin board at the Post Office. The annual pass is a color-coded decal that is affixed to the windshield of your car. I believe each individual is entitled to as many as two passes. The priority pass allows you to use the priority loading lanes (on each side of Hatteras Inlet). Vehicles in the priority lane are loaded onto the ferries first. Other vehicles are then loaded in the order that they arrived at the terminal. Resident priority passes have been issued for about twenty years. They were established to ease the hardship on Ocracoke Island residents who had to wait in ferry lines, sometimes for hours, in order to do many basic tasks (doctor and dental appointments, school basketball games, shopping, civic meetings, car repair, driver's tests, business meetings, professional appointments, etc.). I don't know as much about the other priority passes, but they are primarily issued to businesses that serve Ocracoke Island. Without priority passes many of these businesses (those who deliver food, beverages, restaurant supplies, etc.) would either cease doing business on Ocracoke, or would significantly raise already high prices. I am aware of very little abuse of the priority passes. To my knowledge everyone with a resident pass is entitled to one, and I am not aware of any off-island businesses that misuse the system. Although priority loading may cause some minor inconvenience to visitors to the island, most residents travel off the island on early morning ferries that have very little north bound traffic, and return home late in the evening when south bound traffic is light. On those occasions when islanders or delivery trucks take spaces that could have been used by a visitor, please keep in mind that that may allow a cook or a wait person to arrive at work on time...or permit an elderly person to return home more quickly after surgery...or allow timely deliveries to your favorite restaurant. The system may not be perfect, but it really does work very well. I hope the above information helps explain the priority pass system. It has worked well for two decades, and helps all island residents including those who serve the traveling public. Someone asked me recently: "living on Ocracoke, what's the most important thing to own?" At least half seriously I responded, "A Priority Pass for the ferry!" I understand there's a posting at the Post Office bulletin board that new Priority Passes will be available at the Community Center this Tuesday (A-K) and Wednesday (L-Z) for those who already have one. Bring your old pass, car registration, driver's license proof of Ocracoke PO Box. I'm writing this from memory, so check the bulletin board for times and to make sure my details are correct. 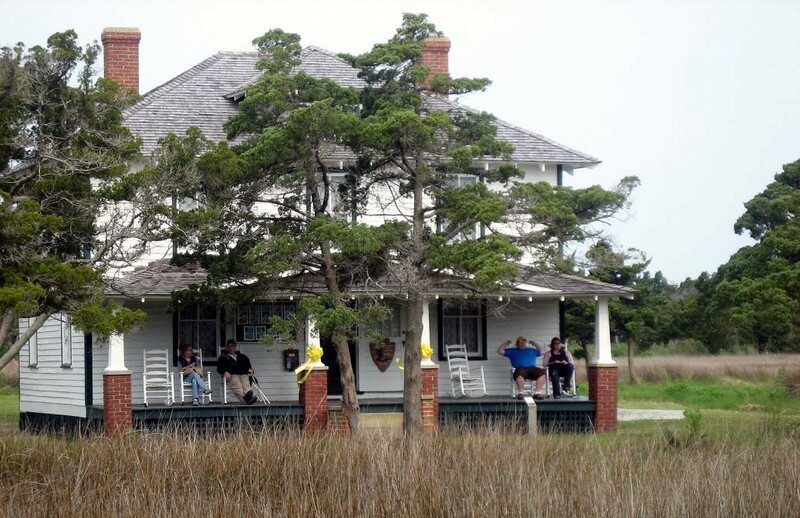 Many of our readers know that the Ocracoke Preservation Society recently used its gift from the Geraldine Beveridge Estate to purchase the Emma and Simon O'Neal House on Lighthouse Road. 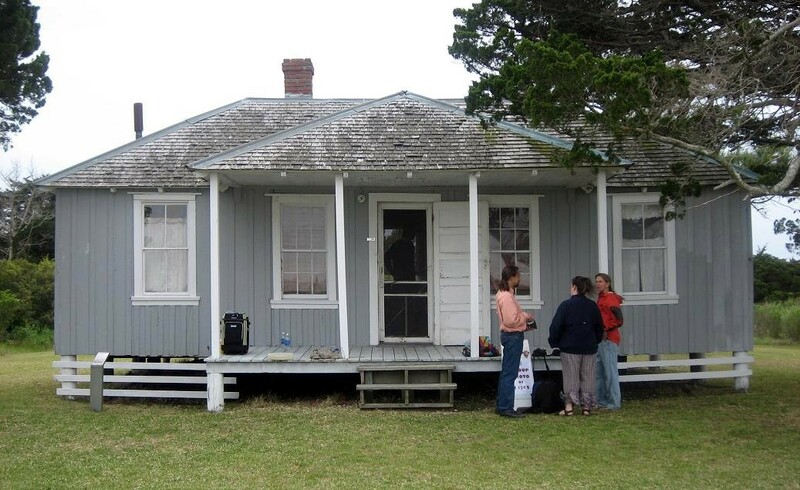 This is a house that was built about 100 years ago and is of great historic value in Ocracoke Village. Trudy Clark, chair of OPS's Historic Preservation Committee reports that they have had about a half dozen personal inquiries and that "the brochures are flying off the fence out front." They are looking for that buyer who will restore the home to historic specifications (and thus enjoy the benefit of generous tax credits). For more information about all of this, you can visit ocracokepreservation.org. Word has gotten around the island that Captain Rob has had to ground his beautiful and beloved sailboat "Windfall". I've been putting off this blog in an effort to get him to put it in his own words, but we keep missing and now he's working on purchasing "Windfall II", so we'll get a full report soon. We look forward to seeing those red sails in the sunset again this summer and wish Captain Rob fair winds! The Red Cross is conducting a blood drive this Monday, April 12, 2:30 to 7:00 PM, at the School. The need for blood is constant (premature infants, cancer treatment, accidents, sickle cell anemia, etc... etc... etc...) and it only takes about an hour. Sure there is a needle...but we are the only source of blood there is. And so many people are not eligible to donate because of a wide variety of reasons. Those of us who can really need to do it because someone will need that unit of blood we give. See you there! High School English teacher, Charles, is directing a "school production" of A Midsummer Night's Dream this Spring. If you see teens wandering around looking distracted, or moving their lips like they're talking to themselves, they may be memorizing Elizabethan dialogue. But in a small community like this, such an undertaking is not confined to high school students. Several adults, like yours truly, auditioned for parts. And a number of younger students have been pulled in to play play faeries and such. Truth is, it's still lots of fun. Charles hopes to do this out doors on a couple of stages with the audience following the action through the magical forest of Shakespeare's world. So hope for good weather April 29, 30 and May 1st on Ocracoke. All this week it has seemed more like August than April on the Eastern North Carolina mainland. Record high temperatures in the upper 80's and low 90's have been set. To the contrary, Ocracoke has enjoyed temperatures in the high 60's and low 70's. Now that IS spring. We've slept with windows and doors open to the wonderful sea-breezes and the sound of the ocean lulling us to sleep. The "Sea-Breeze" is what we have to thank for these delightful spring days. The "sea-breeze" is a circulation of air that develops due to the difference in the suns heating of the land and sea. There needs to be a sufficient contrast between land and sea surface temperatures for the sea-breeze to develop. The pressure gradient that develops as a result of this differential causes the movement of low-level air from the sea to the land (Sea-Breeze) with a return current aloft. This is a regular and welcome phenomenon which brings pleasant cooling to our island in both spring and summer. Another reason ( as if you needed one ) to visit our beautiful island. A few days ago I had a telephone message from a neighbor who said that he had made a "discovery." I was off the island, and when I called him back he explained that he had found a very old piece of wood while he was looking for a window prop. David lives in a century old house and, like folks of a bygone era, still uses wooden sticks to prop open his windows. The interesting thing about this stick, David said, is that it has the initials "E.W.H." 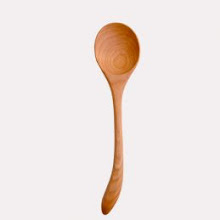 carved in it. As David pointed out, Howard is the only historic island name that begins with "H." Surely one of my ancestors had left his mark on this window prop. But I couldn't think of anyone in my family with those initials. There was Enoch Ellis Howard, and James Wheeler Howard...but no E.W. Howard. David called back the next day. He had carried the stick around with him, showing it to various islanders. On closer examination everyone agreed that the first letter was "L," not "E." Small chips had created the impression of the letter "E."
The mystery appears to be solved. Lawton Wesley Howard was my father's name! He must have carved his initials into the window prop about ninety years ago, when he was a young boy. Actually, he often personalized things that he made (ship's wheels, rocking chairs, even additions to our house). It was a family trait. While I was restoring my grandparents' house I discovered one interior tongue-and-groove board with my grandfather's initials scrawled on the back side. How the window prop came to reside at my neighbor's house we'll never know. But it is now back home, propping up one of my antique windows. Loons, Shuttles, Cats, Lightbulbs, Etc. Hi! This is Philip back with a few comments re. past posts. Recently a reader wrote about finding an injured loon on Ocracoke's beach. Although I can't be sure, my guess is that the loon was not injured. The first time I encountered a loon out of the water I, too, thought it was injured. Loons are aquatic birds, and are spectacularly inept when moving on land. Their legs are far back on their bodies which makes movement extremely cumbersome except when swimming. Loons seldom venture far out of the water, except when nesting. Another reader asked about the recent space shuttle launch. I did not look for it, but perhaps someone else did. I have gone out to the beach to follow previous launches. If the sky is not cloudy the shuttle is clearly visible from the beach as it races across the sky. I was surprised the first time I watched, since the shuttle appears to be traveling, not high up into the sky, but more or less parallel with the horizon. It looked like it might be headed for the Hatteras lighthouse! Someone asked a while ago about names of the feral kitties on the island. Some may have names, but I think there are far too many of them, and few have names. But...if you'd like to adopt one you will be able to give it a creative pirate name! More information is available by following the link below. 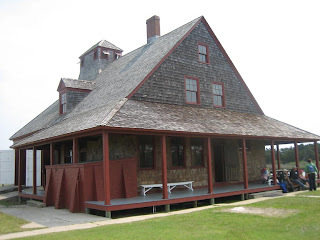 Another reader asked about the type and wattage of the bulb in the Ocracoke lighthouse. If I remember correctly, it is a small halogen bulb (about the size of my little finger...or about the size of the flame of an oil lamp), and is 150 watts. The prisms of the Fresnel lens magnify the light so that it is visible 14 miles to sea. Still another reader asked, some time ago, about who is the oldest person on the island. I'm not sure, but several folks are in their nineties -- both men and women...and the ones that come to mind are active, engaged with life, and impressively sharp (and that's no exaggeration!). 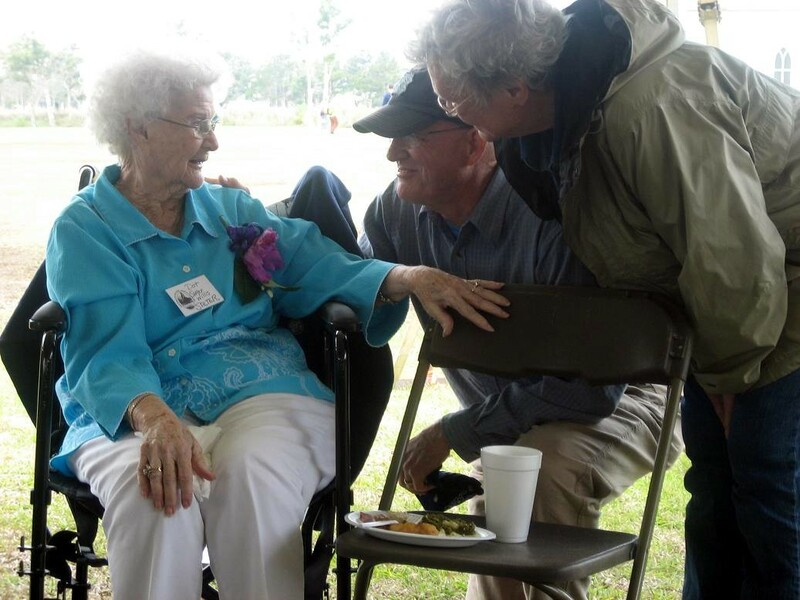 It is not unusual to have at least one centenarian on the island, and we may have more than one in a few years. I think I've answered all of the outstanding questions from the last few weeks. If you have more, let us know. We'll do our best to provide answers. 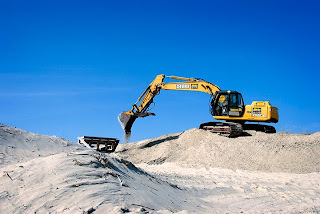 Recently I tried to describe a scene at the beach in which a large machine was clearing sand away from the boardwalk and observation deck at the life guard beach. But, as they say, a picture is worth a thousand words. Don't tell the brave Park Service worker who was doing this, but I was back at the beach of few days later. There was a strong wind off the Ocean and the steps and boardwalk were beginning to get reburied! Life on Ocracoke. The Park Service has announced the birth of a brand new Ocracoke Island pony. It's a girl! (make that "filly") and was born March 22. Students at Ocracoke School named her "Paloma" which is Spanish for "Dove". 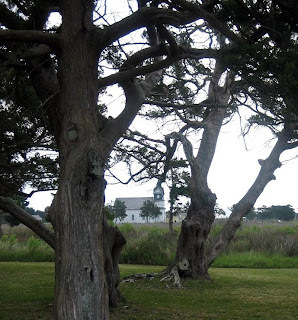 The Ocracoke ponies have been here over 200 years and are thought to be descendants of Spanish ponies that were shipwrecked here, but no one knows for sure. They ran wild and free on the island for most of those years, but now they are tended by the Park Service in 160 acres fenced pasture and are a popular attraction and "The Pony Pen" about 6 miles east of the Village. On a ferry crossing to Hatteras last week, Lida and I got a close up look at a loon swimming in the sound. I could see some of its brilliant summer black and white plumage already. A few evenings ago, I took an after supper walk out to Springer's Point. The Sound was smooth as a lake and slate gray under low clouds, but busy with birds. Pelicans glided by just inches off the Sound surface; a pair of mallards landed just 10 yards or so from where I was standing. And off in the distance I saw what I believe was a pair of loons on the water. It was too far for a definite identification, but they were low in the water like loons, had the silhouette of loons and were diving under the surface for extended time like loons. This is especially fun for me because of all the time I've spent on the Northern lakes canoeing and enjoying the antics and "music" of loons. A reminder to everyone that the 2010 Ocrafolk Festival Easter Fundraising Concert will be held Saturday April 3rd at the Community Center. The concert begins at 7:30PM with the doors opening at 7PM. Tickets are $15.00 for adults and $7.00 for children. Refreshments will be available. Proceeds go to support the non-profit Ocrafolk Festival being held this year June 4th-6th. More information may be had at www.ocrafolkfestival.org. We hope all who can will attend the concert. It is always a wonderful time. Another reminder that our Ghost and History Walks have begun again for the season. Please call 252-928-6300 from 10AM to 5PM daily for information and reservations. Our Ghost and History Walks are held Tuesday and Friday evenings at 7:30PM. Tickets are $12.00 for adults and $6.00 for children under 12 years of age. Don't miss them. They are great fun!